For the Broken Hills in Churchill County, Nevada, see Broken Hills. 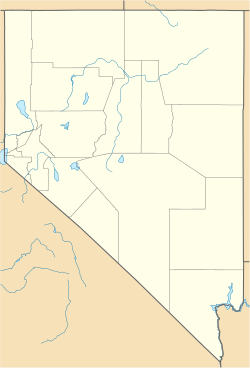 Broken Hills is a ghost town in Mineral County, Nevada. It was primarily the site of the mining operation of miners, Joseph Arthur and James Stratford from 1913 to 1920. The settlement reached the height of popularity during World War I. Broken Hills reached the height of population, with a few hundred residents, from 1915 to 1920. The town had stores, a hotel, saloons and a school. By 1920, both Arthur and Stratford's mining efforts only produced $68,000. Arthur and Stratford then sold their claims to George Graham Rice, who promoted the mine and sold shares of property. Rice invested $75,000 of stockholder money into the mine to produce only $7,000 of revenue. Other mining companies in the area also failed. In 1926, there was a silver rush to the Quartz Mountains nearby, and the post office and a few stores at Broken Hill reopened. After 1928, the settlement declined again, but mining continued in a limited away. The area produced approximately $180,000 from 1935 to 1940. ^ "Ghost Towns Broken Hills, Nevada". Retrieved 13 April 2011. ^ a b c Paher, Stanley W (1970). Nevada Ghost Towns and Mining Camps. 69: Howell North. ^ a b "Broken Hills". Forgotten Nevada.org. Retrieved 17 September 2018. This page was last edited on 25 October 2018, at 19:04 (UTC).